Much like projects and experiential learning in a classroom take students out of textbooks and into self discovery, travel opens student minds to memorable learning. While adventuring, students may be exposed to culture, outlooks, customs, terrain, language, activities and natural wonders that they can discover in ways unlike a classroom allows. They'll remember the experience, and be fueled for the start of something bigger. In the beginning of their ninth grade year, freshmen have a two-day, one-night retreat. The retreat provides the entering freshman class with a series of bonding activities under the auspices of Pathfinders Outdoor Education counselors and chaperoned by Shorecrest administrators and faculty members. Students undertake a series of outdoor challenges to solve problems together and develop leadership skills. Some of the activities will include the High Ropes Challenge, a Zip-line, canoeing, a bonfire, and a night hike. These experiences are designed to enhance class unity and develop friendships with the new Shorecrest students and US Shorecrest teachers. Read more on the Service Week 2017 page. Summer trips to Europe are frequently offered to our Upper School students. Note: There is no school coverage for students not participating in field experiences. Families must make alternative arrangements for their children during these time periods for non-attendees. A four-day/three-night excursion to our nation’s capital. Eighth grade trips to Washington DC are a rite of passage in many independent schools, and our trip is an important link to our students’ understanding of our country, our culture, and America’s role in the global community. This trip builds beautifully on two years of global studies in Grades 5 and 6 social studies and two years of American experience in Grades 7 and 8. Integrating social studies, English, world languages, art, architecture, math and science, students visit historical sites such as the Capitol, historical monuments on the Mall, and many museums including Smithsonian sites. A three-day/two-night experiential history and environmental studies opportunity located in and around St. Augustine, FL. Students explore the Castillo de San Marcos, Old Town, Fort Mose, and other historical sites in America's oldest city. 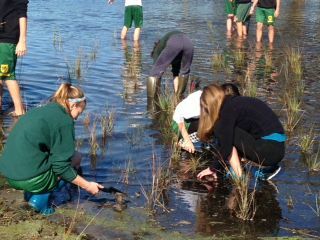 Students will also study the North Florida environment and how it related to the development of the area. A major focus second semester in seventh grade is the class project on disease and history, and the field experience provides students the opportunity to explore the impact of disease on the Spanish colonial town. An incredible one-night trip exploring, discovering and dreaming at NASA immersed in space and science, including an overnight sleeping under space shuttle Atlantis. Students will expand on their classroom learning for a night of exploration and discovery. The experience also includes an Astronaut Encounter with a veteran NASA astronaut. 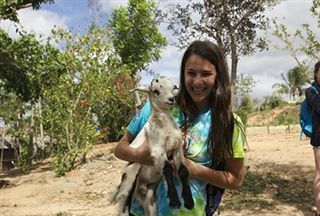 For the last two years, Middle School students have had the opportunity to travel during Spring Break to Cuba for service and Spanish immerson, or France for a French immersion trip. Señora Emili Jaime-Allwood, the Lower School third and fourth grade Spanish teacher, took a group of fourth grade students and parents to Spain in the summer of 2017.